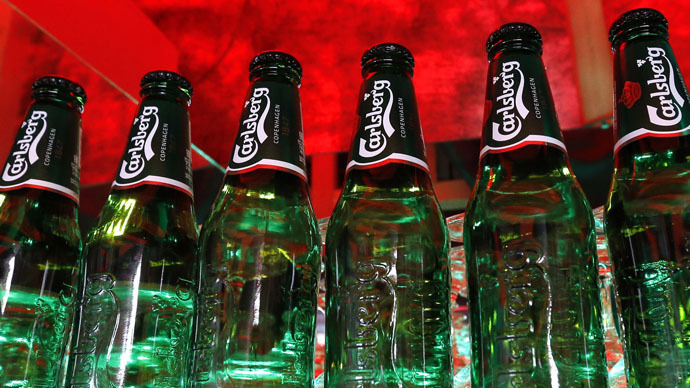 Danish brewer Carlsberg reported an unexpected net loss of more than $13 million in the first quarter, saying the revenue from its key Russian market fell drastically due to unfavorable currency fluctuations. The world’s fourth-largest brewer said on Tuesday it lost 90 million Danish kroner compared with a loss of 67 million kroner a year ago. Analysts expected a net profit of 11 million kroner. Operating profit before special items rose by 8 percent to 661 million kroner compared with 453 million year in the same quarter of 2014, due to the growth in demand in Western Europe and Asia. The company added that it expects a similar increase in operating profit during the whole year. Sales in the first quarter amounted to $13.47 billion, up 4.4 percent from $12.90 billion year on year. Carlsberg said it suffered the biggest loss in Eastern Europe as revenue there fell by 30 percent in the first quarter compared with the same period a year earlier. The brewer’s losses in Russia were primarily caused by currency fluctuations; the company estimated their impact at 29 percent and was ready for such results, said CEO Joergen Buhl Rasmussen. While the region offers long-term growth opportunities, the increased uncertainty and volatility required incidental expenses and scenario planning, said the company. Due to the complicated macroeconomic environment in the region, the Russian beer market declined by about 9 percent in annual terms in the reporting period and in Ukraine by 14 percent. The decline in the Russian beer market began before Western sanctions and the collapse of the ruble. The excise duty on beer rose from 3 rubles to 18 rubles per liter between 2009 and 2014, forcing a reduction in beer consumption in Russia. However, the company said it remains committed to Russia despite the negative earnings. Danish brewer Carlsberg A/S was founded in 1947. It has more than 500 brands, including Carlsberg, Tuborg, Kronenburg and others. It owns 89 percent of the share capital of Russia’s largest brewing company Baltika. The company's products are sold in more than 150 countries.